Iâ€™ve done a lot of reading the past few years on SEO and Adwords to bring visitors to my site, but by far the most creative and interesting discipline is optimizing the conversion rates on my website. Every website has a goal. 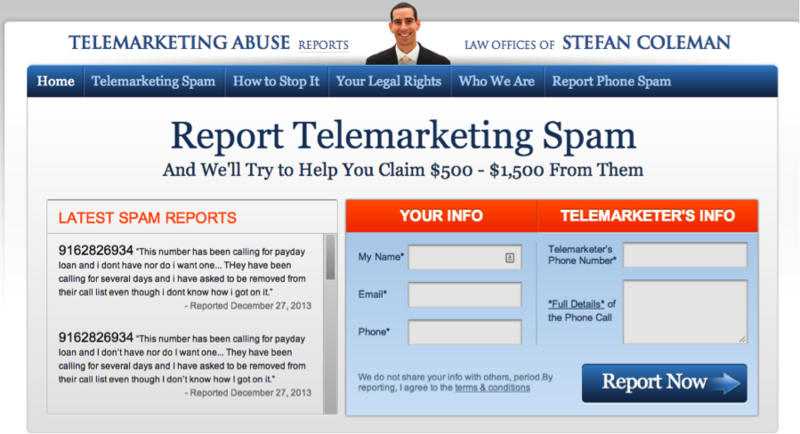 The goal of my website: Report-Telemarketing-Abuse.com is to provide a forum where consumers can report unsolicited telemarketing calls, junk faxes, and text message spam. The key for my website to be successful means that I must generate traffic and convert that traffic to take an actionable step i.e. 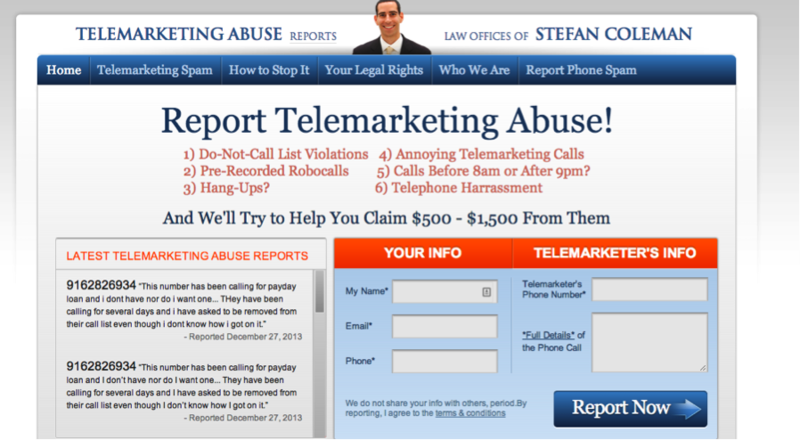 filling out the telemarketing abuse report on the website. When I designed the website, I designed the website with what I though would convert the best. I put the report form right in the center of the website. If thatâ€™s the primary goal of the website, it only make sense to put it front and center. Also, I made the form the only actionable item on the website. I didnâ€™t want to distract the users with a number of actionable options. Also, I chose to display the â€œLatest Reportsâ€ within the form because I wanted consumers to know from the very beginning (a social element if you will) that other people are also reporting. This provides an element of social influence â€“ if others are reporting then maybe the user will go ahead and also report. Conversion rate optimization is all about experimentation. Experimentation means changing the headline, the form, your pitch, etc. I had a decent conversion rate on the above landing page but I had a feeling that if I added some more context behind it I could increase the conversion rate. I added the following text below which appears in orange. I was shocked to find out that my conversion rate actually went down by 2% when I added the text in orange (this experiment was conducted with 2,000 visitors).Â This is really the most important point I can make in this article.Â Iâ€™ve worked with a lot of designers over the years.Â Unfortunately, I donâ€™t know any that have done any conversion rate experimentation.Â Therefore, when you all are designing itâ€™s kind of tragic to think that you all donâ€™t know what converts and what doesnâ€™t.Â This little experiment showed me that â€œless is more.â€Â By providing too much content, some of the users may have gone into “information paralysis” by too much content and moved on without filling out a report. All of you designers probably care about conversion (since youâ€™re conscientious enough to read this article) but I meet a lot of designers who know nothing about the science of conversion rate optimization.Â If you know what converts and what doesnâ€™t then you become significantly more valuable as a designer! My message to all you designers would be that if youâ€™re designing for conversion to design a few different versions of your design and test them.Â Once you test which version works, then test within that version.Â Conversion rate optimization is like anything on the Internet, itâ€™s a continuous process not a one-time event.Â What do you all think? Stefan Coleman is a Managing Member at Law Offices of Stefan Coleman, LLC. He currently focuses on class actions such as product defects, false advertising, and privacy rights cases. Stefan Coleman, LLC. has been involved in several major class actions as the firm continues to protect the rights of consumers. Aside from being a great lawyer, Stefan also knows how to build landing pages that convert!